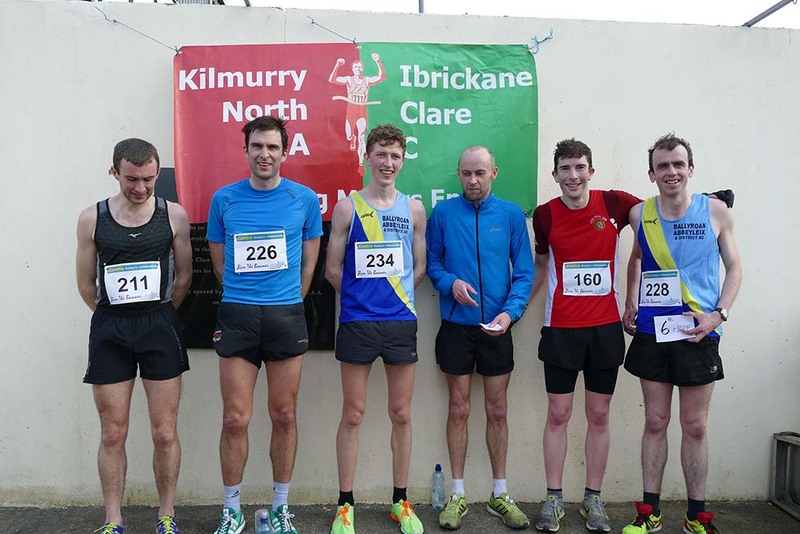 THE 49th Kilmurry Ibrickane-North Clare Athletic Club and Run the Banner 2019 Road Race Series number 2 and Michael Egan Memorial five-mile road race and 5km fun walk attracted a very high-quality field of runners and walkers to the start with Kenneth Rodgers, St John’s, having the field on a big chase when he set out on a very fast pace from the Quilty Tavern, along with Rory Chesser, Ennis Track, and Cian McDonald, Ballyroan/Abbeyleix and District AC. The group of three were together for three miles, until Rodgers made a decisive move with the wind to his back and on the Quilty-Kilrush Road, he had 20 seconds on Chesser with a mile remaining and he held that lead all the way to the finish to retain his title in 26.40 from Chesser (26.57) and McDonald (27.20). Ennis Track took the team title and the Michael Egan Shield, with a total of 28 points. Second were St John’s on 45 points and third were Kilmurry Ibrickane/North Clare on 54. The Run the Banner 2019 attracted a very large group of ladies. Selenia Nolan Culligan (Ennis Track), Claire Madigan (St John’s), Ann Marie Connellan (Ennis Track) and Kate and Niamh McDonald (Ballyroan/Abbeyleix and District AC) were together at the halfway point against a very stiff breeze. In the steady climb to three miles, Culligan and Madigan began to break away. They were together for the final two miles and with 400m to go, Madigan upped the pace to take the title in 32.50, just six seconds ahead of Culligan, while in third place was Anne Marie Connellan (33.31). Ennis Track won the ladies title on 20 points from the host club, Kilmurry Ibrickane/North Clare, on 54 points. Ladies 5km: Áine McDonald (Ballyroan Abbeyleix and District AC). Men’s 5km: Joshua Moloney (Kilmurry Ibrickane/North Clare). Ladies five mile: Claire Madigan (St John’s). Teams: Ennis Track (2. Selenia Culligan, 3. Ann Marie Connellan, 7. Laura Chesser, 8. Mary Cahill) = 20 points. Masters Ladies O-40: Mary Cahill (Ennis Track). O-50: Ita Hanrahan (Ennis Track). O-55: Rita Kierse (St Mary’s). Junior Ladies: Gráinne Lynch (Kilmurry Ibrickane/North Clare). Senior men five mile: Kenneth Rodgers (St John’s). Teams: Ennis Track (2. Rory Chesser, 5. Brian Murphy, 10. David Lyons, 11. Billy McKenna) = 28 points. Masters Men O-40: Fergal Grogan (St Mary’s). O-45: Kevin Shalloo (St John’s). O-50: John O’Gorman (Kilmurry Ibrickane/North Clare). O-55: Cormac Downes (Clare Crusaders). O-60: Martin McDonald (Ballyroan Abbeyleix and District AC). Junior men: Ronan Donnellan (Kilmurry Ibrickane/North Clare).